OKLAHOMA CITY - The Oklahoma City Dodgers and The Oklahoman will host open auditions Saturday, March 2 at Myriad Botanical Gardens for musical performers to sing or play "The Star-Spangled Banner" before Dodgers home games throughout the 2019 baseball season and online registration is now available. The ninth annual National Anthem Tryouts presented by The Oklahoman and the OKC Dodgers will take place from 10:30 a.m. - 3 p.m. March 2 and be held for the first time at the Myriad Botanical Gardens Water Stage in downtown Oklahoma City. Tryouts are open to the public and registration begins today online at: milb.com/oklahoma-city/community/national-anthem-tryouts. The first 125 people to register will have a guaranteed audition. Registration slots typically fill well in advance of the event each year, so interested performers are encouraged to register early. The auditions draw a wide variety of performers from the Oklahoma City area, as well as from across the state of Oklahoma and even a handful from surrounding states. Performers will take the stage at the outdoor amphitheater in front of a live audience and a judging panel consisting of editors and columnists from The Oklahoman, city officials and community leaders. Winners will be selected based on voice quality, creative style and stage presence. 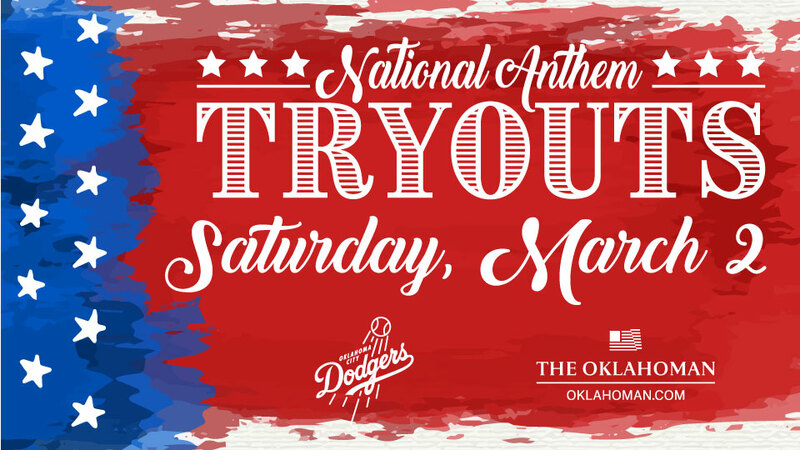 "National Anthem Tryouts are always a fun kickoff to our baseball season each spring and we enjoy listening to all of the skilled performers who come out to audition," Oklahoma City Dodgers President/General Manager Michael Byrnes said. "The Myriad Botanical Gardens will provide a scenic and unique backdrop to the event this year, and we look forward to a live preview of the talent that will be showcased at Chickasaw Bricktown Ballpark throughout the 2019 season." Winners will perform the national anthem at Chickasaw Bricktown Ballpark throughout the upcoming 70-game home schedule. The grand prize winner will perform as part of Opening Day Thursday, April 4 when the Dodgers host the San Antonio Missions. Those who do not register online will have a chance to audition on a standby basis the day of the event. If the tryouts run ahead of schedule, or if a performer does not show up for a scheduled time, those in the standby line will be chosen to audition. Standby performers are encouraged to arrive early and will be selected on a first-come, first-served basis. For more information about National Anthem Tryouts presented by The Oklahoman and the OKC Dodgers, 2019 season ticket packages or group outings, call (405) 218-1000 or visit okcdodgers.com.